Discover the next software engineer who will get your business running at full speed at General Assembly. 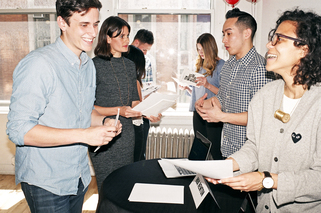 At our exclusive event, recruiters and hiring managers will meet expert-trained, job-ready candidates. Discover the hard and soft skills that developers have built at GA, including methodical problem-solving, version control and collaborative development, and testing and debugging. Hear from each developer and preview their latest full-stack projects, which are built from scratch in one-week sprints. Discover the ideal person who will fill the gaps in your dev team and push your business forward. GA candidates can bring diverse professional experience to your team. Many of them are looking for junior-level roles aligned with the skills they just developed at GA, while others are suited for mid-career, management-level opportunities. Our candidates are interested in learning about paid opportunities on a full-time, contract, freelance, or internship basis. Can't make it? Email julie.carroll@generalassemb.ly to find out how you can still get in touch with our developers. You’re following Meet and Hire: Software Engineers.